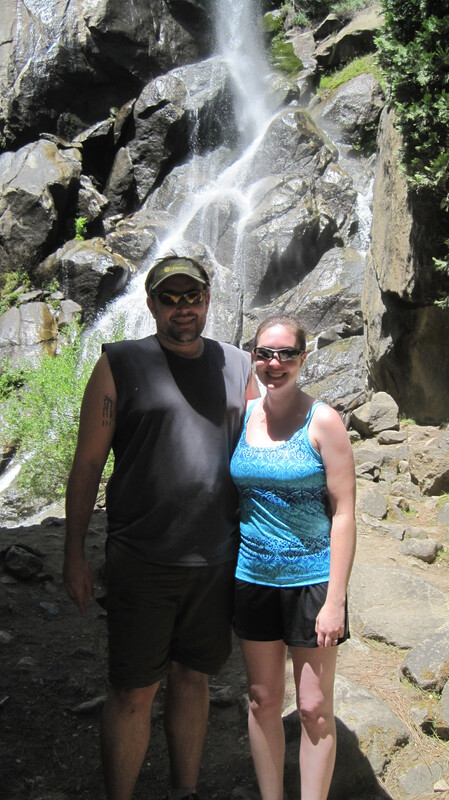 My husband and I just spent the day in Kings Canyon National Park. Because of my back pain and fatigue issues, this was our first real outside adventure since we moved to Santa Barbara (unless you count snowboarding near Las Vegas in January, during which I stood up a grand total of three times on the bunny slope and quit after the first hour). We want to go backpacking in August, so I need to start getting back into shape after spending the last few months mostly in, on, or near the bed. 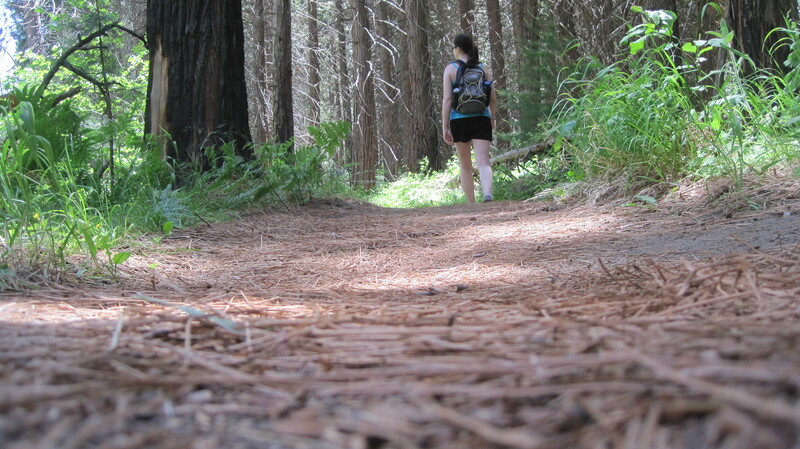 Kings Canyon is beautiful, and we were able to enjoy three short, easy hikes in about four hours in the park. For a full account of our journey, visit my husband’s hiking blog here. All day today, I couldn’t get this quotation (above) out of my head. I am learning to use the “quiet, regular, short step” of the experienced mountaineer. My husband is constantly reminding me to slow down, pace myself, and enjoy the surroundings, but my destination-oriented brain is solely focused on getting from point A to point B as quickly as possible. I want to be finished, to go back to the car feeling successful. I want to hurryupandgetthere! I’m the same way in my spiritual life. I want the “fun stuff” of God’s revelation without putting in the time being quiet, being regular, and being well-paced. This is what I love about centering and contemplative prayer. These practices are a way of entering into the space where we may encounter God, where God may encounter us. But I’m easily distracted, rushed, irregular. I fill up my days with television and music and talking and all the loudness of life. And when I do set aside time to be still and quiet and experience the presence of God — I want to hurryupandgetthere, too! But today, in Kings Canyon, we didn’t really have much of a destination at all. The park itself was our destination, and so I was able to enjoy being at the place we wanted to get to, wandering among the meandering paths — paved and unpaved. For the first time, I was aware of more than just my feet plodding, rushing to the next shaded spot, the crux of the next hill. I was aware of more than just my labored breathing, my annoying allergies, my sciatic nerve. For the first time, I was able to really look at the mountains and the trees, enjoy the grassy meadows and rivers, feel the mist on my face from the waterfall, notice the smell of pine and cedar on the breeze, look back at my husband and smile. For the first time, I was able to appreciate the journey, pace myself appropriately, and experience the healing and renewal that come with just being outside among the sun and shade and surprising beauty. There’s something about being outdoors that opens us up to natural revelation, to the friendly camaraderie of strangers enjoying a common activity, and to the slow and steady pace and rhythm of a lifelong pursuit of Jesus. I had planned to write a post for today about ways to pray other than naked. (If you missed Stacey’s guest posts on praying naked this week, you can read them here and here along with my introduction.) But I got caught watching a video of Eugene Peterson’s recent talk “Practicing Sabbath” at Q with Dave Lyons, and I couldn’t get this excerpt out of my mind. Nothing happens when you pray, you think. There’s nothing in prayer that gives you any satisfaction in terms of having accomplished anything. So learning to pray is learning to not do in the awareness that God is doing something and you don’t know what it is at that moment. When people ask me how to pray, sometimes I’m tempted to tell them what I do that first hour in the morning [here he is referring to his daily devotional time of reading scripture and praying the Psalms], which I’ve done since I was 15. But I realized at one point, that’s not so. When I leave my study, close my Bible, that’s when I’m praying. I pray all day. Prayer now is something that suffuses my life. Most of the time when I’m praying I don’t know I’m praying. Later on I realize I have been. But to get to think about prayer in a little more comprehensive way as the interior life that the Holy Spirit is breathing in us every time we take a breath suddenly changes prayer from being a practice like you practice the piano to being a practice like you practice being a lawyer or practice being a parent or practice being a carpenter. You’re doing it when you don’t know you’re doing it. My goal–and the witness of a lot of people I’ve read through the centuries–is not to pray in such a way that you’re conscious of praying but to live a life suffused by prayer so that your life becomes a prayer. But that’s not the kind of thing you can write a book about. It’s only a thing you can live and see other people live. If “play” and “pray” don’t work together, both are diminished. That’s why both are necessary. Otherwise, they become duties that you have to perform. Whether you pray by getting naked, going for a hike, reading scripture, interceding for others, contemplating or meditating, or any of the many, many other ways to pray–let prayer suffuse your life so that you experience the inspiration [read: breath] of the Holy Spirit with every breath. How do you pray? Share your experience in the comment box below.